This essay was originally published in Art And The Performance Of Memory: Sounds And Gestures Of Recollection, ed. Richard Candida Smith, “Memory and Narrative” series, Routledge, New York, 2002. Breathless, panting with exertion, film archivist Ivo Levy gasps this story into life haltingly, beat-by-beat, as he runs, bent down with the weight of heavy water canisters, across a Sarajevo bridge. Alert, hounded by the omnipresent snipers and shells, Levy recounts this experience to the Greek filmmaker, A, with an urgency that mirrors the desperate encounters that run all the way through Angelopoulos’ Ulysses’ Gaze (Theodorus Angelopoulos, 1995) – fleeting connections driven more by need than by desire, more by pressure than by choice (2). A, played by Harvey Keitel, has travelled across seven countries and into the war-zone in search of the film reels in Levy’s lab: three undeveloped reels, perhaps the first film of Greek cinema. While the narrative of A’s quest enacts the repeated rituals of borders and divisions across the rugged terrain of south-eastern Europe, it is crossings and connections that drive it forward – the bridge rather than the boundary is its pertinent motif. “Yugoslavia is full of rivers”, says the journalist who directs A to Sarajevo. Rivers are the conduit that bring A to Levy and the “golden fluids” in his lab, and fluids mark the affective poles of the film: frozen in ice, driven in rain and snow, suspended in mist, swirling in the river currents, and singing in the developing lab. It is also an economy of fluids that defines Angelopoulos’ shooting style: frozen moments, fluid mobile camera, and the porousness of sensation as sound bleeds across image and image melts away into the fog. How then can we understand how this film has been described in the rhetoric of barriers, distance, disconnection? (3) Individual elements in the film may be seen in this way, if viewed in isolation, clinically: camera distance, for example, the preponderance of long shots; or the slight disjunction between character and performance (Keitel does not so much speak his lines as they speak through him). The film, however, orchestrates these elements, mobilises their energies, toward a riveting affective engagement with history, desire, identity, love and their entwinement together. Ulysses’ Gaze produces an affective agitation that can only be understood by examining Angelopoulos’ work with his spectator, and it is a sense of fluidity that pervades this work also – a sense that the subjectivity of the spectator is not a boundary, but a permeable membrane, that the images, soundscapes and sequences of the film can permeate the “skin” of the spectator. I believe something special happens on location, in the real place, and I do not mean just the ability to photograph the decor, the landscape. But it is more that when I am in the place I have set the film, all five of my senses are working. I become more completely aware. I therefore feel I am living the experiences I want to film (5). While many critics have attempted to explain how it is that Angelopoulos can draw his audience into an intense, visceral engagement with the unfolding crisis of the Balkans, citing his constant blurring of the boundaries between history and fiction, or history and myth, this one quote, perhaps more than any other, can assist to unravel both the principles which inform his filmmaking, and the extraordinary affect which his films can produce. Indeed, in this statement, Angelopoulos reveals the particular quality of the cinematic intelligence that finds its way onto his screen. This could be encapsulated as an understanding of the sensory intensification of experience as the vehicle by which an affective charge is translated from filmmaker to audience, and of the role of the material elements of the film as the means to produce this. Angelopoulos clearly understands these material elements – landscape, decor, etc., as energetic units, as potential units or sparks of experiential energy. This relationship between the objects or elements of the material world and their capacity to generate a sensory awakening – so pivotal to understanding the affective work of Angelopoulos’ film – is often overlooked in the critical literature. Indeed, the theoretical frameworks which could address this sensory/material aesthetic derive from “the roads not taken” in the development of film theory as a discipline and are only now being reinscribed into contemporary debates, with the consideration of the embodied aspects of cinema spectatorship (6). Central to these contemporary debates has been the work of scholars such as Miriam Hansen, whose detailed excavation of the writings of Siegfried Kracauer has given the question of cinematic materiality a historical framework (7). Hansen highlights Kracauer’s focus on the “physical, tactile dimension of film spectatorship” (WS p. 458), which, she claims, offers “a theory of a particular type of film experience” (8). To Kracauer, she argues, “film addresses its viewer as a corporeal, material being … it stimulates the material layers of the human being … it seizes the human body with skin and hair” (WS p. 458). While Kracauer’s theoretical work has repeatedly been dismissed by film theorists as “naïve realism”, Hansen argues that his early work opens up a “notion of the material dimension [which] is far more comprehensive than the term ‘physical reality’”, and “[his] concept of realism … is bound up with the problematic of the subject (rather than simply film’s referential relation to the material world)” (TOF p. xvi) (9). Cinematic reception is crucial to this understanding. Hansen discerns what she calls a “centrifugal tendency” in Kracauer’s film theory – the physiological impact of the film induces “a movement away from the filmic text and into cinema – [into] … the social, public space of reception” (TOF p. xxxiii); on the level of reception the “material dimension assumes a life of its own and triggers in the viewer associations, memories of the senses . . .” (TOF p. xxviii). Whereas conventional notions of realism focus on questions of authenticity or verisimilitude, Kracauer writes of the experiential potential of the close-up, for example, to “blast the prison of conventional reality”: a familiar pair of hands in close-up “will change into unknown organisms quivering with a life of their own” (10). The sensory/material focus in Angelopoulos’ work situates his project as pivotal to these attempts to reinscribe the question of cinematic materiality at the centre of contemporary theories of cinema, and to rethink notions of cinematic realism. While working with the actual locations of present and historical events, Angelopoulos does not envisage these “material realities” as outside the experience of them: location is privileged not for verisimilitude, but for the sensory associations and memories it can evoke. Angelopoulos’ description of location shooting mirrors Kracauer’s “seizure” almost word for word: “When I begin a new film and I begin to travel around looking for locations with Giorgos Arvanitis, my friend and cinematographer, I often start to feel a tingling in my skin, the hairs of my arm standing up . . .” (my italics) (11). Angelopoulos’ vigilance to the senses, his search for the production contexts and locations that will arouse this vigilance, are intrinsically linked to both the corporeal, material focus of what Kracauer calls “psychophysical correspondences”, and to Walter Benjamin’s related concept of “mimetic innervation”. The mimetic here is “a mode of cognition involving sensuous, somatic, and tactile forms of perception … [which] transcends the traditional subject-object dichotomy” (NOW p. 5): the concept emphasises the “palpable sensuous connection between the very body of the perceiver and the perceived” (12). Innervation is understood as a mode of perception that “reconnects with the discarded powers … of mimetic practices that involve the body” (NOW p. 6), as a “mimetic reception of the external world … that is empowering” (13). As Hansen reads this focus in Benjamin on the corporeal, material aspects of this mimetic innervation, it is a two-way process, encompassing both a movement away from the sensorium into the world and an “ingestion or incorporation” of the world (14). As such, the concept envisages “the precarious boundary or rind of the bodily ego [as] a bit less of a carapace or armor and a bit more of a matrix or medium – a porous interface between the organism and the world that would allow for a greater mobility and circulation of psychic energies” (NOW p. 5). This concept of mimetic innervation is the crucial term to understanding the central role the senses play in the way Angelopoulos draws his spectator into the complex and traumatic history of the Balkans. Through his description of the elements of a location as not just objects to be photographed, but as catalysts to a sensory awakening, by “redeeming” the material elements – landscape and decor – from an “object” status, Angelopoulos extends this sensory understanding of “corporeal material nature” explicitly to what has traditionally been defined as mise en scène: the “elements” of mise en scène become experiential entities, potential sites for mimetic innervation. By envisaging mise en scène within the terms of this “porous interface” between spectator and the material, the materialities of cinematic experience are understood as intrinsically linked with the affective power of cinema. The focus on reception applies pressure to the notion of the “material world”, challenging the empiricist thinking about mise en scène which has underpinned conventional notions of cinematic realism. Mise en scène is the critical link in the relationship between the material dimensions of cinema and its affect. The chrysalis of this understanding, kept in hibernation for so long through the decades of ideology-based and psychoanalytic film theory, begins to mature and reveal its potential with the re-emergence of interest in the material and the corporeal aspects of spectatorship, particularly with the more rigorous studies of Benjamin and Kracauer and the paradigm shift this work has effected. The relevance of this latter work to the understanding of mise en scène, however, has been almost suffocated by the critical entropy imposed on the term in contemporary Anglo-American film studies: it has evolved in its most common, contemporary usage as one of the most sterile of analytical terms, degenerated in film teaching and theory into an empirical term used to describe the elements of the profilmic (that which existed in front of the camera at the time of shooting). One need not look very far to find endless inventories of the so-called elements of mise en scène, divorced from their context in the energetic work of the film. Again and again, English-language texts start doggedly from a literal translation of the French: “mise en scène means literally ‘what is put onto the stage’”; and proceed to apply this mechanically from stage to screen: “costume, décor, lighting, camera movement, setting and the behaviour of figures” are enumerated as if this technical scrutiny of each term, divorced from its synthesis in the film, or from the reception of the ensemble for an audience, provides productive analytical tools (15). Mise en scène has been described as the “grand undefined term” of film theory (16). Adapted from the stage, its understanding has been persistently shackled by this heritage in the stasis of the proscenium arch. While objects can be “put onto the stage” in theatre and be expected to maintain their integrity as solid objects, no such assumption can be made in cinema. How can the common theatrical understanding of mise en scène make sense in cinema? An object does not maintain its status as an object once it is in the frame: colour or a set are not merely background – they are by definition part of the ensemble of experience of the spectator, constituted in and through the temporal experience of a scene/a shot. As Kracauer writes, cinema does not just reproduce the material world, but “brings the whole material world into play” (WS p. 447). There is of course no such thing as “put onto the stage” in cinema, only what is put into the scene. This is not just what has been “put” into the frame (in the past tense: by definition the result of an action already completed, rather than a present moment in play), but what is put into the moment of experience, how the spectator is drawn into the scene at the moment of its unfolding (17). This double-edged materiality is what a theory of mise en scène must address: how are the elements of the material world both material and energetic at the same time? And what is the relationship between sensory experience and affective experience? Once we understand the concept of mimetic innervation, this mimetic appropriation of the material world that, in the moment of contact, generates an “affectively charged, excentric perception”, as Hansen describes it (NOW p. 10), how then do we rethink the materiality of mise en scène within this relationship? Our understanding of mise en scène is, of course, constituted in the definition of the term, and only a definition in process, that is, of the operation of mise en scène in situ, can provide a productive understanding. The early writings of the critics and filmmakers of Cahiers du cinéma in the ’50s and ’60s avoid a literal transposition of the concept from stage to screen, and provide the beginnings of a dynamic understanding of mise en scène. In Fereydoun Hoveyda, it is inseparable from the process of its conceptualisation, part of “the intellectual operation which has set to work an initial emotion and a general idea” (18). In Alexandre Astruc, mise en scène is also understood as a conceptual process, as “interrogation and dialogue”, and, when he explains this on a more material level, “mise en scène … [is] a certain way of extending states of mind into movements of the body. It is a song, a rhythm, a dance” (19). Despite being limited by the auteurist emphasis on mise en scène as an expressive tool for the genius of the director, these writings contain the germ of an understanding of mise en scène as energetic process, rather than empirical object or technique. Astruc in particular, in his later work, formulates mise en scène as an energetic engagement with the spectator: “What pleases me [in a film] is the mise en scène: to make the spectator feel the moment of disequilibrium where everything suddenly falls apart”; (20) and “[the] mise en scène is a look which forces people to act, which has a power over what it looks at” (21). In his writing on melodrama in the ’70s, Thomas Elsaesser extends this understanding of mise en scène as energetic, through his exploration of the emotional effects of what he calls “melos” (22). The “dynamic use of spatial and musical categories” characterises what he describes as a “subtle and yet precise formal language” brought into play in the “orchestration of emotional effects” (p. 287). Constrained by the structuralist model of language which saturated film theory in the ’70s, Elsaesser does, nevertheless, insist on melos as a material, affective counterpoint to the linear meaning-producing structures of language, and thereby keeps alive the understanding of mise en scène as an energetic field (23). Despite the recognition in the early formulations that mise en scène comes into being in the interface with the spectator, we still find, omnipresent in film theory, the clinical dismembering of the so-called elements of mise en scène which renders the use of the concept as an analytical term defunct. Angelopoulos leaves this sterile empirical understanding for dead when he describes and works with the appropriation of location, landscape and decor by the filmmaker in the terms of sensory intensities. These corporeal, material intensities which cycle between filmmaker, film and audience could perhaps best be described in murky, indistinct terms like sympathetic vibration, as redolent as they are with indefinables like intuition, feeling, resonance, or intensity. From Angelopoulos’ description of the central role of his own sensory experience, we have an understanding that what is paramount here is that he produce an image which, for him, generates a sensory awakening, an innervation. The implication is that an experience which resonates so provocatively for him will also resonate for the spectator. Angelopoulos himself has signalled the importance to his work of this “vibration” with the spectator: “I need to see the eyes of the others. Only in the regard of the viewer do I recognize what I have made” (24). This idea of sympathetic vibration or resonance is the core of the mimetic capacity – “the capacity to relate to the external world through patterns of similitude, affinity, reciprocity and interplay” (NOW p. 5). This affinity is not the meeting of one identity with another, in a recognition of the referent. Recognition and memory are freed from the exclusive logic of the literal, and reactivated in the logic of the visceral. It is a “sympathetic vibration” that puts me into action as a spectator, that “puts me into the scene”. It is a staging of my full mimetic potential that evokes the connection. Circumscribed of course by cultural memory and tradition, and assuming that this resonance will be layered – some layers more universally recognised than others – this mimetic capacity holds the key to understanding the role of the corporeal, the material in the affective work of images (25). It is precisely the lack of an adequate understanding of the relationship between affect and mise en scène that hampers some of the critical work on Angelopoulos, particularly that which locates his work within a modernist canon. David Bordwell, for example, argues that detachment and distanciation provide the key underpinnings of a form of “de-dramatisation” which assimilates Angelopoulos to a modernist aesthetic (26). He claims that techniques used to “drain away drama from charged situations” characterise Angelopoulos’ films, and dissects the visual techniques of Angelopoulos to establish stylistic similarities with modernist directors such as Michelangelo Antonioni. Founding his analysis on the principles of visual composition in Angelopoulos’ films, Bordwell finds “empty spaces” (p. 17), “dead intervals” (p. 22), the “suspension of dramatic progression … detached contemplation and dry, understated emotion” (p. 18). 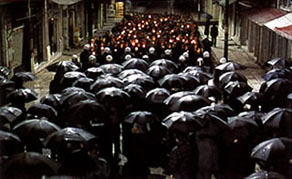 However, it is only through an understanding of mise en scène which severs visual technique from the performative unfolding of a film across time, that Bordwell’s study of the techniques of Angelopoulos’ cinematography could yield nothing but an inventory of devices of visual style, conceived as akin to static pictorial design (27). The only way to see Angelopoulos’ and Arvanitis’ shots as dead or inert would be to rob them of this temporal amplification which is at the core of Angelopoulos’ cinematography – all of the elements he deploys are fused together, pressured, transformed by time. Even on the level of shot construction, Angelopoulos’ image and sound are conceived in terms of dynamic energies which escalate with the pressure of time: tensions between static, monolithic city structures and the movement of figures that run in diagonals across them; between vault-like interior spaces or vast desolate landscapes, the groups and individuals dwarfed by them and the relentless, exuberant movement of the camera; between vision withheld and the knowledge that breaks through the shot with the sound. At the border with Albania, A’s taxi picks up a frail old lady left stranded in the snow, travelling to meet the sister she has not seen for 47 years, since the civil war. In the centre of Korytsa, they leave her in the icy town square, and as the car drives off into the silent snow, she is dumped by the narrative, incidental to A’s journey. As the camera pulls back, abandoning her, a vast empty expanse of grey road and white sky engulfs her tiny lost figure. Even as she becomes just another incidental casualty of Balkans dislocation, the desolation of the square lingers in an overwhelming sense of vulnerability, bewilderment and disorientation. As A returns to “snow and silence”, her memory echoes across the subsequent shots. As A crosses the border into Albania, the camera tracks across vast fields of static human figures, mute, immobile against the icy landscape, waiting or watching: Albanian illegals, “rifiugati” as the taxi driver calls them. The shot slides in one long take from closely-framed naturalistic dialogue and action of A and the taxi to the epic panoramas of ritualised stasis and motion. As the spectator is transported across these physical divides, Eleni Karaindrou’s haunting music, a monotone, accompanies the choreography of the camera in a hypnotic harmonic register. Static, mute figures give way to the movement of people trekking through the snow and then the constant motion of nameless figures walking the streets cloaked in ice and snow. Icy hillside, sky, streetscape and figures blend into one palpable rhythm of moving figures, the sensuous caress of the fluid camera and the hypnotic music. The solidity of human figures and buildings have only a tenuous claim on the shot, as the coordinates of the space become indistinct, the horizon suspended somewhere between the hazy white sky and the white, snow-covered hillside. Time becomes indeterminate, as the camera tracks through the streets in slow motion while figures walk briskly by. As eerie as this sequence is, to talk of it simply as mood, understood in a cognitive sense, would miss the intense corporeality of its affective charge. Even as the viewer is left to puzzle over the significance of the figures in the snow, this is not an absence, an empty space – as the camera glides in long shot past the silent figures dwarfed against the desolate landscape, the spectator absorbs the epic dimensions of this historical moment mimetically – a whole history of displacement and dislocation inscribed in one shot as a visual, temporal and aural rhythm. Bordwell marginalises this affective engagement with an image: effects not affects are his focus. It is only by detaching, in the analytical moment, the frame, the light, and the mobility of camera from their inscription across the bodies of the spectator, that these techniques can be seen as formalist devices, universalised across genres and cultures, working toward a universal goal of distanciation. To focus on these stylistic similarities is to miss their differences, for modernism is not just a set of techniques, but their deployment in a particular context toward particular ends. As Fredric Jameson writes, “’style’ can so often look like a relatively simple recipe: … when we enumerate a certain number of the classic features of Angelopoulos’ style, we risk … reducing the unique pleasures of his work among an enlightened public to a formula” (28). While the paradigm of modernism may shed light on Angelopoulos’ earlier films, in the case of Ulysses’ Gaze, even though the film does draw on some elements of a modernist idiom, this analytical grid obscures at least as much as it reveals. While a grid suggests that the stylistic elements of a film can be mapped according to fixed co-ordinates, and with mathematical precision, it is imprecision which marks the rhetorical tropes of Ulysses’ Gaze, and the indeterminate, shifting dynamics of spectatorship which must be explored to arrive at any productive understanding of the film. Ulysses’ Gaze is full of scenes which are open-ended, whose meaning can’t be pinned down. The chaotic, unpredictable flux of history in the Balkans throws up moments which resonate according to the memory, the experience, the chance location of the viewer upon that flux. Angelopoulos works these indeterminate moments to draw his spectator into an engagement with the uncertainty and ambivalence of this history – nowhere is this more profound than in the camera’s extended eulogy to Lenin. As the demolished statue of Lenin is transported down the river in fragments, his finger still pointing the way forward from his severed arm, throngs of watching people drop to their knees, making the sign of the cross. While the figures on the bank running to keep up with the barge are mute, numbers in a crowd, the statue of Lenin, his face in close-up, becomes articulate. His face maintains a composure, heroically moving forward to dominate the frame; his slightly furrowed brow looks clear over the horizon. Even the concrete ear of Lenin is granted the right to take over centre frame in close-up, holding the viewer in its sway. Even as Lenin’s statue evokes awe, nostalgia or fascination, other lines, traces, cross each other, sometimes as distant echoes, shockwaves reverberating from the same source across different terrains. Lenin’s grandiose passage is in stark contrast to the ravages of history unfolding in its wake; his concrete cerebrum maintains a solidity against its scaffold that is not permitted the concrete rubble of Sarajevo. This Lenin only barely masks the many others that shadow his passing, those dismembered, brought down in triumph, smashed with sledge-hammers across the breadth of former communist Europe. His trajectory is layered, saturated, steeped in monumental significance and ambiguity: condensed into the resonances of a few long takes is the momentous history of the aspirations and allegiances, the demise and contradictions of the whole of communist Europe, gliding by in a solemn obituary. Without doubt there are sequences, particularly in the first half of Ulysses’ Gaze, which work to disable a more conventional “psychological” viewing. However, relinquishing the modernist grid reveals a much more complex set of strategies for engaging the full affective potential of the viewer. There is dislocation in Ulysses’ Gaze, to be sure – the awkwardness between Keitel and the lines which “recite him”, as mentioned previously. A woman who has lost her husband/lover to the shelling is driven to Keitel’s body. 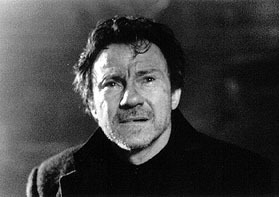 Her embrace, however, is not with Keitel, but with the lover whose name she calls repeatedly, inscribing it over the substitute flesh of Keitel: “Vania, Vania, Vania…” This fissure between actor and character, the mismatch between body and identity, between need and realisation are not the estrangement of modernist distanciation. These interactions are not suspended in a field of abstract disjuncture, but driven to forge new links across the gaps, links that resonate with stifled cries, inarticulate sobbing, or the wailing wrenched not from Keitel’s throat but from somewhere in his entrails. How can we think of this visceral unleashing as a modernist distanciation? Angelopoulos has said that he “hopes to create a new kind of audience, ‘not just a consumer who uses only his emotions, but a person who uses his mind’“ (29). To reduce this to simply an “alienation effect” is to ignore the affective part of the equation. This is not an either/or that Angelopoulos offers, but a more complete affective and intellectual synthesis. As Andrew Horton claims, “the mixing of theatricality and reality in his films often leads us into a deeper, fuller, emotional bond with the film” (CC pp 14–15). Hansen has pointed out the ways in which the “tradition of narrative film conflicts with a materialist aesthetics of film because it imposes the closed structure of ‘a finite, ordered cosmos’ upon the heterogeneous, heteronomous, open-ended flow of life” (TOF p. xxxi). Applied to Ulysses’ Gaze, the modernist grid simply posits a binary opposition to classical narrative, one in which any gaps in the narrative flow are seen as either a lack or a radical disjuncture: both models impose the primacy of the cognitive interpretation of a film over a materialist aesthetics. 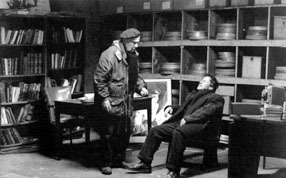 Kracauer’s attention to the material experience of reception offers a much more productive understanding of Angelopoulos: his understanding sidelines this rigid opposition, in favour of “loosely composed, ‘porous’, ‘permeable’, open-ended narratives … that leave gaps into which environmental life may stream” (TOF p. xxxiii) (30). Just as Kracauer’s analysis moves “away from the filmic text and into the cinema … the space of reception” (TOF p. xxviii), the analysis of Ulysses’ Gaze must acknowledge “the gaps and fissures in the filmic text that allow for moments of contingency and indeterminacy” (TOF p. xxxiii), that lead “into the slippery realm of experience, the heterogeneity of social space, the unpredictable dynamics of public life” (TOF p. xxxiv). Angelopoulos clearly conceives of his film in terms of drama: in response to a suggestion that Ulysses’ Gaze ends on a depressing note, he evokes Aristotle: “I would say simply what Aristotle said about tragedy, that a drama or, in this case, a film should evoke pity and fear in an audience, and then create a catharsis by which these emotions are released” (LM p. 105). It is not necessarily a “draining away of drama” that Angelopoulos achieves in Ulysses’ Gaze, but a diffraction of the drama through several means. If one was to draw a flow chart, a score of Ulysses’ Gaze, the melodies, the rhythms that run through it would emerge as dramatically counterpointed one to the other – sound, colour, landscape, figures and narrative are orchestrated through time in elaborate relationships, patterns, divergences. It is here that Sergei Eisenstein’s conception of the elements of a film as a score really comes into its own – it is the polyphony, the complex orchestration of these divergent instruments that Angelopoulos is working with in his search for the sensory amplification of experience. While it is vision that propels the narrative of the film – Keitel’s desperation to “see that gaze”, the gaze revealed in the Manakis brothers’ undeveloped film reels, propels his journey across the Balkans – vision, the gaze itself, is constantly undercut, prefigured or superseded by sound. At times, the emotional registers of the film are largely carried by the aural density – a cacophony of industrial noise, engine hum, mechanical winches and fog horns that accompanies the instalment of Lenin’s head scrupulously into place in its collar-bone on the barge; a ritualised confrontation between shuffling feet and running boots as the police run between demonstrating religious fanatics and umbrella-wielding movie spectators in a dark street; the amplified interrogations of border guards reverberating through the dark night across the restless, rootless space of the frontier. It is vision that collapses finally in Sarajevo. At the moment in the film that appears to be its culmination – Levy has discovered the formula to develop the three film reels, to recover the “lost gaze” that has been the object of A’s quest – footsteps and the music of the youth orchestra signal the welcome relief of the fog that descends on Sarajevo, shielding its citizens from the omnipresent threat of snipers. As Levy, A and Levy’s family walk through the city in a joyous respite, vision yields to the sounds in the fog – the nursery rhymes of children wafting through the mist; a motor that warns of a soldier’s approach; a mother’s desperate pleading; shots, one after another, dull, final; and the aching wailing of Keitel. It is as if the whole film has led, inexorably, to the collapse of vision and its substitution with this visceral cry. The narrative of Ulysses’ Gaze is a quest, a journey: reflecting the ur-story of Ulysses, A is propelled toward his goal which momentarily finds resolution before its success disintegrates, fragments with the brutal killing in the fog. Set against this striving to reach a goal is another trajectory which moves inexorably downwards, toward decline, devastation. Just as A’s Greek taxi driver talks of Greek civilisation as a 3,000-year fall from glory, the film itself is like a relentless collapse in slow-motion: as A travels across Europe toward Bosnia, solid buildings give way to rubble, window panes to blackened holes, the remnants of civil society to barbarism, hope to anguish, faith to despair. Just as the landscapes follow a trajectory of their own, the journey is enacted as a tightly-controlled progression through the cold, retracting end of the colour spectrum. Angelopoulos and his cinematographer, Giorgos Arvanitis, work in a palette of muted browns, blues and greys. Fawn and slate, with an occasional tinge of a dark, muddy purple-brown give almost the only respite from black, white and grey. Only in Sarajevo does a hot orange-red emerge with the fires in the deserted streets, and the red of the developing lamp in the lab, only to be blanketed, smothered in the relentless white spread of the fog. It is this structure of “images which resonate, reverberate and ricochet off each other [in a] honeycomb of meaning” that epitomises Gerald O’Grady’s description of Angelopoulos’ layering or mosaic-like “tessellations” of “significance”, the structuring of material elements into the “making and merging of multiple metaphors” (31). O’Grady lays the understanding of temporality into this spatial structure of tessellation, claiming that “Angelopoulos’ many angles of incidence reflect more and more light at each successive moment of his films, and even more enlightenment when one reflects on them” (p. 56). The echoes, the layering of metaphors and memory traces, circle back as each new scene harvests the resonances of the layers set down before. It is this “enlightenment” that leads Andrew Horton to nominate Angelopoulos’ films as a “cinema of contemplation” (LM p. 1). And yet, a “cinema of contemplation” or “meditation”, as Horton refers to it elsewhere, cannot do justice to this multi-layered experience which in-corporates – makes corporeal or material – our experience, both intellectual and emotional, of the histories and stories which unfold. Contemplation here is a disembodied term. That one is left contemplating a film like Ulysses’ Gaze is not in question, but one is also left with inarticulate sensation, traces of sounds, spaces, fragments, that permeate and linger in the corporeal memory. It is, above all, a cinema of embodied affect. How do we understand the “tessellation” of images – and sounds, rhythms and colours – that ricochet off each other? What is the mechanism of their collisions? Kracauer refers to a similar dynamic when he claims that film “brings the material world into play”, arguing that cinema has an “affinity with the pulsations of material life” (WS p. 451). Kracauer gives this pulsation a topographical metaphor when he claims that film “comes into its own when it grasps the material dimension” – he writes that film “pushes downwards”, into the “lower levels” (WS p. 447) (32). If one was to apply the same topographical metaphor to the model of contemplation that informs Horton’s and Bordwell’s readings of Angelopoulos, film would be seen to strive upward, toward the “higher” levels of intellect. This is the blind spot in much of the critical writing on Angelopoulos: it is a reluctance to conceptualise spectatorship as material, spectators as embodied, and affect as simultaneously intellectual, emotional and corporeal, that mandates this recourse to contemplation as the defining motif to explain Angelopoulos’ films. The implications of this characterisation of Angelopoulos’ work as a contemplative cinema extend into the consideration of history, and the assumed strategies for staging historical questions for the spectator. 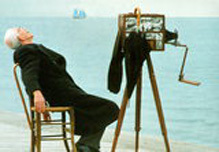 Bordwell, for example, argues that the techniques of “dedramatisation”, by which he characterises the “minimalist”, modernist shooting style in Angelopoulos’ films, “block empathy”. This leads, in his reading of the films, to a critical detachment which in turn leads us “to consider the larger historical forces at work” (33). The rhetorical moves which underpin this argument are standard in the critical literature on modernist film: empathy is withheld by refusing the psychological techniques of close-up, character identification, etc. ; attention is deflected away from absorption in emotional pathos, and onto detached intellectual contemplation; the familiar is “made strange” and the lethargic viewer is jolted into critical awareness. None of these rhetorical moves can be adequately applied to Ulysses’ Gaze. The affective power of the film is neither equivalent to, nor dependent on, empathy. Affective intensity is not deflected onto intellectual contemplation, but diffracted, dispersed across all of the available sensory registers; it is not detachment that ensues, but a more embodied engagement. Angelopoulos refuses to remove history from its material, lived experience: his spectator does not need a break or rupture from the senses to grasp this history: not simply an object of cognitive or contemplative awareness, it is enacted on the sensorium. In Kracauer, as Hansen argues, the concept of embodied spectatorship is inseparable from an understanding that, by its assault on the senses, film “dissociates rather than integrates the spectatorial self” (TOF p. xxvii). Both Kracauer and Benjamin draw on the concept of distraction to argue that film “still contains the possibility of losing oneself, albeit intermittently, of abandoning one’s waking self to the dreamlike, discontinuous sequence of sense impressions” (34). Any account of Angelopoulos’ historical project must acknowledge this potential “dissolution” of the contemplative subject: in its affiliation with Benjamin’s “mimetic innervation”, Angelopoulos’ work with the affective potential of the embodied sensory/material experiences of cinema is, as Hansen writes of Benjamin’s concept, “anything but the critically distanced, testing look of the Brechtian observer” (35). The emphasis on the work of the senses, on a sensory awakening, links Angelopoulos’ project to a broad body of work which questions the role of the senses in modernity and attempts to grasp the experience of the sensory moment (36). Leo Charney has outlined the concern of philosophers of modernity with the ephemerality of the moment as a characteristic of modernity, its contradictory status as both present, “immediate [and] tangible sensation” and simultaneously “fleeting, tentative and unstable”. Through this category of the moment, Charney has charted the links between the concern of early filmmaker and theorist, Jean Epstein, with the “fleeting fragments of [sensual] experience that the viewer cannot describe verbally or rationalise cognitively” (p. 285), and the “category of the sensual moment” which informed the Russian Formalist Viktor Shklovsky’s understanding of defamiliarisation: both explore the “possibility of experiencing a moment … feeling the presence of the moment, fully inhabiting it” (p. 279) as a means to “to seize fleeting moments of sensation” from their evanescence (p. 293). While Angelopoulos’ work with the senses, in Ulysses’ Gaze, is inseparable from his work with the material experience of temporality, this is informed by an entirely different understanding of the relationship between temporality and sensory experience. The spectator is not jolted into fleeting moments of awareness and sensation, and time here is not the passing of this intense, fleeting experience of the ephemeral moment, not its undoing, but the intensification of the experience through duration. The passing of time does not carry us away from sensation but into it; time does not disperse the awareness but deepens it. Rather than punctuation or interruption to “passages of [otherwise] lost time” (IM), in Ulysses’ Gaze, sensory experience is a dilation of time, like a slow-release time-bomb. In Ulysses’ Gaze, Angelopoulos’ shots set up a resonance which bit by bit infiltrates through layer after layer: osmosis not rupture. By stealth the shots shift registers for the viewer; like sound, the image sets up a rhythm, a vibration which spreads across the film. The amazement that these shots can awaken is not a piercing of the alienated sensorium, the epiphany of a single moment breaking through the flow, but the amplification of the experience of that flow itself. In Charney’s account, “Epstein conceived of film as a chain of moments, a collage of fragments … “ (p. 285). In Angelopoulos, time is an accumulation, a layering: more like laying tracks one over the other, than a collage of disparate moments. To come back to Sarajevo, Ivo Levy and the bridge: there is no moment in this shot that could encapsulate it: it is only on the maturation of the shot, its denouement, that one can say, “that was the shot”. There is no single moment of visual pyrotechnics which propels the shot into sensory awareness: the movement of the figures and the “song” of the fluids, as Levy recites it, give the shot a rhythm, a pace, breathe it into life. The bridge itself is like a suspension bridge, a scaffold on which the song is suspended, unfolding into significance with the passage of time. The action is played against the base line of the bridge like a foundation: the running figures cut a diagonal arc across its monolith, the two articulated against the flat white sky which leads nowhere, more like a screen than a space. The bridge does not stay still. It quivers, pulsates, amplifies, as Levy’s recitation is inscribed across its span with the beat of his gasping breath. The dynamic energies and tensions of the shot shift as it unfolds, its momentum generating the “centrifugal force” that projects the viewer onto the screen of history, of memory: the incongruity of this gasp of life struggling to preserve itself in the face of despair and futility is inscribed across the viewer’s sensorium. Kracauer’s discussion of the corporeality of cinematic reception, while cryptic, is framed within what he calls the physiological dimension: “such kinesthetic responses as muscular reflexes, motor impulses, or the like” (TOF p. 158). Within this model, shock plays a central role in accessing this material dimension. Kracauer posits corporeality within the terms available from physiology, and incorporates his understanding of “psychophysical correspondences” into this physiological model. However, the phenomenological tradition makes a clear demarcation between the physiological concept of the body, or Kœrper, and a separate understanding of the lived body, or Leib (37). While the physiological model delimits physiological stimulus, such as movement or shock, as the “trigger” of a corporeal response, the concept of the lived body does not prescribe the understanding of corporeality in this way: it is more amenable to understandings of affect, and the relationship between sensory and affective experience, and also more compatible with understandings of memory as embodied. This model also allows for a different understanding of the means to access the material, corporeal aspects of cinematic experience. Not necessarily tied to the physiological concept of shock, an understanding of corporeality as Leib distances this question from traditional distinctions between montage, aligned to shock, and mise en scène, aligned to duration. While Angelopoulos’ work with temporality relies extensively on the materiality of duration and the unity of space that come with the long take, other techniques, working with a comparable grasp of embodied spectatorship, could also engage the viewer in a similarly sensory-affective register. Ulysses’ Gaze’s corporeal address does not rely on shock, with its foundation in sensational effects to elicit a “physiological” response. The root impulse of the film, its source, is not journalism, as it is for other films that attempt to show the realities of war: Welcome to Sarajevo, for example, that sprays its opening credits across the screen like a volley of rapid bullet fire and confronts the spectator with the horrors of severed limbs and bleeding flesh. The cringe, the retraction from the shock of these images of devastation, the withdrawal into the defensive “stimulus shield” that characterises Benjamin’s understanding of this shock experience, is the antithesis of the experience for the spectator of the shooting in the fog in Ulysses’ Gaze. While vision is snuffed out, occluded by the fog, the spectator strains to grasp more of the shot, is actively transported into the shot, scanning the white screen for clues with all the senses awakened. The terrible knowledge that reaches the spectator with the sound, as Levy and his entire family are shot, does not reach a hardened, toughened shell, but an anxious, alert sensory web, open, searching for significance. It is not just the immediacy of the present moment that Angelopoulos targets with this sensory heightening, but the potential of an experience to go beyond that moment, to connect with other layers of embodied experience and memory, and thereby, through this embodied experience, to access the significance of history. In Benjamin, the “antidote – and counterconcept – to technologically multiplied shock and its anaesthetizing economy” (NOW p. 5) is the capacity for mimetic innervation, the “possibility of undoing the alienation of the senses” (NOW p. 2). Benjamin’s understanding of experience (Erfahrung), of the “fullness of experience”, rather than being tied to the “present” moment, is intrinsically linked to the question of memory, “the faculty that connects sense perceptions of the present with those of the past” (NOW p. 2). It is memory, the “mémoire involontaire”, or involuntary remembrance, which brings a “painful shock of rejuvenation … when the past is reflected in the dewy fresh ‘instant’” (38). The past evoked by this involuntary memory, as Benjamin sees it, is “somewhere beyond the reach of the intellect, and unmistakably present in some material object (or in the sensation which such an object arouses in us”) (39). The sensory evocation of this involuntary memory is the key to understanding the affective power of Angelopoulos’ exploration of Balkans history. Horton has written that “few filmmakers anywhere have been so concerned and involved with history from such a variety of angles” as Angelopoulos, and cites Nikos Kolovos who writes that “[Angelopoulos’] films are meditations on history, not historical films per se” (CC p. 56) (40). The quest which drives the journey of A across the Balkans is itself a dialogue with the entire history of cinema: A searches for a “vanished gaze”, a “gaze struggling to emerge from the dark – a kind of birth”, “a captive gaze from the early days of the century set free at last at the close of the century” (41). (This lost gaze is given a mnemonic presence by the mesmeric repetition of a few shots from the earliest known Greek film, the Manakis brothers’ The Weavers of 1905). Just as the narrative enacts the search for a lost historical moment, the film takes place across a transhistoric field. Its scope is a century of Balkan conflicts, and beyond. Just as the Manakis brothers filmed “all the ambiguities, the contrasts, the conflicts in this area of the world”, the polemical complexities of Balkan history are inscribed across Ulysses’ Gaze. These conflicts themselves are cast into a broader frame: when two journalists in Belgrade argue over whether the Serbs or the Albanians arrived first, “the conclusion is it’s Hegel’s fault for influencing Marx”. Sarajevo, in Angelopoulos’ own words, is “a symbol for all of Yugoslavia” (LM p. 103), and as the birthplace of the First World War, a symbol for all of Europe. Fredric Jameson credits Angelopoulos with the reinvention of a historical cinema, at a time when “such approaches to cinema were becoming ever scarcer”, and with a redrafting of the terms of realism (42). Jameson speculates “that it is the commitment to matter in his cinema which successfully neutralizes or at least suspends the fictive, while it is the commitment to perception and its temporalities which neutralises or suspends the documentary” (p. 88). Jameson links the impact of Angelopoulos’ historical cinema to his work with temporality: “perhaps it is this distended temporality itself which allows for this realism of the interstices, between the scripted sequence of narrative events” (p. 82). Jameson claims that these elements in Ulysses’ Gaze “demand us to invent a new kind of reception or reading … an enlargement of our perception of narrative time” (p. 84). And yet, while posing the question of what this new form of reception might entail, Jameson deflects the answer onto the content and narrative structure of the film. The core of Angelopoulos’ achievement in reclaiming a space for a historical cinema, as he sees it, is a spatiality that clearly demarcates it from modernist work (43). Jameson’s argument seeks to establish an affinity between new narrative structures and transformed social and political realities. Recurrent scenes in Ulysses’ Gaze at frontiers, border posts, transit stops, etc., lay the groundwork for what he calls a “transnational spatiality”, and a new form of “narrative spatiality”, which he defines as a “regional epic” (p. 91 ff) (44). However, Jameson’s argument leaps almost entirely over the question of how reception is refigured in Angelopoulos’ historical cinema. Some of the answers to this question can be drawn from Angelopoulos’ transformations of narrative form, but narrative structure itself must be understood within the framework of its reception if it is to provide any insight into the historical impact of Ulysses’ Gaze, or the new formal situations that it explores. Read with one eye on the epic frame and the other layers, these moments of slippage emerge not as devices of distanciation but as devices of connection – the affinity that is evoked here is not necessarily on the level of form, between narrative structures and global realities, but on the level of reception: a mimetic affinity, a resonance between the quotidien narrative of the film and memory traces of other stories or histories, echoes of other journeys, other quests, other traumas. It is in this way that O’Grady’s “tessellations of significance” weave their way through the recurrent icons and motifs of the film into the corporeal memory. But how does the viewer navigate from one level to another, what is the mechanism that allows the viewer to slide across the layers as if narrative and mythic time and space, past and present are permeable membranes of a single field? Benjamin’s concept of “mimetic innervation”, with its emphasis on the role of involuntary memory, is the closest we can come to encapsulating this process. Angelopoulos’ exploration of Balkans history is inseparable from this evocation of involuntary memory: more than simply a blurring of history and fiction or history and myth, it is his blurring of history and memory, his interweaving of one temporality with the other, that gives the historical frame of Ulysses’ Gaze a profound affective charge. It is his ability to draw, from the materiality of the mise en scène, a spark, a trigger – to generate a sensory experience that evokes a mimetic affinity with other embodied experience, an affective resonance. At the core of this fusion between history and memory, between memory and the senses, and between sensory experience and affect is a profound understanding of cinematic experience as simultaneously corporeal and affective and of mise en scène as the material core of embodied cinematic experience. I am grateful to Richard Candida Smith, whose editorial advice was both theoretically incisive and generous. I would also like to thank Sinead Roarty and Laleen Jayamanne who both offered very generous assistance with detailed critical readings and editorial suggestions. This term, ‘precarious boundaries’, is borrowed from Miriam Hansen, in Miriam Bratu Hansen, ‘Benjamin and Cinema: Not a One-Way Street’, Critical Inquiry, vol. 25, no. 2, winter 1999, p. 5 (henceforth NOW). Ulysses’ Gaze (To Vlemma Tou Odyssea) (Theo Angelopoulos, 1995). This rhetoric is particularly pervasive in the work which frames Ulysses’ Gaze as a modernist text, see for example David Bordwell, “Modernism, Minimalism and Melancholy: Angelopoulos and Visual Style”, in The Last Modernist: The Films of Theo Angelopoulos, ed. Andrew Horton, Flicks Books, Trowbridge, 1997, p. 106 (henceforth LM). The war in Bosnia erupted with the break-up of former Yugoslavia in the wake of the collapse of communist governments across Eastern Europe at the end of the 1980s. Following the declaration of independent republics by Slovenia and Croatia, support for independence by Muslims and Croats in multi-ethnic Bosnia-Herzegovina was rejected by Bosnian Serbs, who laid siege to the Bosnian capital, Sarajevo. As negotiations between Serbs, Muslims and Croats failed to agree on the terms of a future republic, and NATO, the United Nations and the European Union failed to broker a settlement, war also broke out between Muslims and Croats. The war raged for several years, characterised by ‘ethnic cleansing’, reports of atrocities against civilians and a refugee crisis with vast numbers of displaced people from the former Yugoslavia. Greece was also entangled in the regional instability, with its opposition to the declaration of an independent Macedonian republic. Andrew Horton, The Films of Theo Angelopoulos: A Cinema of Contemplation, Princeton University Press, Princeton, N.J., 1997, p.199 (henceforth CC). Quote from an interview with Angelopoulos, July, 1995. Miriam Hansen: ‘the metaphor of the many roads not taken in early film history, that Tom Gunning uses, Benjamin’s phrase of a ‘forgotten future’ – there are so many starts, beginnings, directions that history has discarded and that still contain utopian possibilities. That forward look backward…” In “’The Future of Cinema Studies in the Age of Global Media’: Aesthetics, Spectatorship and Public Spheres”, interview with Laleen Jayamanne and Anne Rutherford, UTS Review, vol. 5, no. 1, May 1999, p. 100. Miriam Hansen, “’With Skin and Hair’: Kracauer’s Theory of Film, Marseille 1940”, Critical Inquiry 19, Spring 1993, 437–469 (henceforth WS). Miriam Hansen, introduction to Theory of Film by Siegfried Kracauer, Princeton University Press, Princeton, 1997, p. x (henceforth TOF). Hansen has highlighted the long-standing critical misunderstanding of Kracauer’s concept of the ‘redemption of physical reality’ (TOF, p. ix). Tracing the complexity of Kracauer’s proposition of a materialist film theory from its development in his Marseilles notebooks in the 1940s, Hansen points out that Kracauer’s early ‘notion of the material dimension is far more comprehensive than the term ‘physical reality’ ‘ which predominates in Kracauer’s 1960s published work, Theory of Film (TOF xvi). Through his focus on the ways that the photographic (and cinematic) image is grasped as a material entity which is engaged directly by the material, corporeal capacities of the spectator, Kracauer argues for the ‘redemption of physical reality’ — the redemption of our understanding of the image from its supposed referent to the real, and its conceptualisation in relation to the subject. Hansen points out that Kracauer’s material world is ‘not merely an object of representation, but crucially includes the subject and the subject’s relation to the Other”. Siegfried Kracauer, TOF, p. 48. Horton, “’What Do Our Souls Seek?’: An Interview with Theo Angelopoulos”, in Andrew Horton (ed), The Last Modernist: The Films of Theo Angelopoulos, Flicks Books, Trowbridge, 1997, p. 106 (henceforth LM). Michael Taussig, Mimesis and Alterity: A Particular History of the Senses, Routledge, New York, 1993, p. 21. As Taussig elaborates the concept of mimesis, it has two parts: the first, the idea of imitation or copy, as in the capacity to mimic, and the second, the idea of contact, this much more complex visceral experience of a relation, a porousness between one’s self, one’s own body and the objects or images of the world. It is this second aspect of mimesis that it most useful to this discussion. This understanding of mimesis has an affinity with the contemporary rethinking of perception by perceptual psychologist, James Gibson, whose model of ‘ecological perception’ describes the ways in which the beholder ‘inhabits the spectacle’, as Sue Cataldi describes it. See Sue Cataldi, Emotion, Depth, and Flesh: A Study of Sensitive Space: Reflections on Merleau-Ponty’s Philosophy of Embodiment, State University of New York Press, Albany, 1993. Cataldi relates Gibson’s understanding of perception to Merleau’s ‘flesh ontology’ to develop a theory of affective experience and its relation to perception. For an extended discussion of these arguments as they relate to film theory, see Anne Rutherford, “Cinema and Embodied Affect” Senses of Cinema 25, March-April 2003. Hansen explains innervation as “broadly, a neurophysiological process that mediates between internal and external, psychic and motoric, human and mechanical registers” (NOW 4). Crucially, in Benjamin this is understood as a two-way process, i. e. “not only a conversion of mental, affective energy into somatic, motoric form” (NOW p. 5), but also the possibility of the reverse. The concept of innervation is linked here to his concept of the “optical unconscious” as the condition of possibility for this innervation to be brought into play (NOW p. 10). Hansen points out the associations between Benjamin’s “innervation” and the mimetic ‘psychophysical correspondences’ which Kracauer explores (TOF p. xxvix). See also Hansen’s discussion of the relationship between Benjamin’s understanding of innervation and Eisenstein’s revision of William James’s “axiom that ’emotion follows upon the bodily expression’”, NOW, p. 5. It encompasses both ‘a decentering and extension of the human sensorium beyond the limits of the individual body/ subject into the world … and an introjection, ingestion or incorporation of the object or device’ (NOW, p. 10). See for example, David Bordwell & Kristin Thompson, Film Art: An Introduction, McGraw Hill, New York, 1997, p. 119. Brian Henderson, ‘The Long Take’ in Movies and Methods vol. 1, ed. Bill Nichols, University of California Press, Berkeley, 1976, p. 315. This argument is developed more fully in “Cinema and Embodied Affect” (see note 12). Fereydoun Hoveyda. “Sunspots”, in Cahiers du Cinéma, The 1960s: New Wave, New Cinema, Re-evaluating Hollywood, ed. Jim Hillier, Harvard University Press, Cambridge, 1986. Originally published as “Les Taches du Soleil,” in Cahiers du Cinéma 110, August, 1960. Alexandre Astruc, “What is Mise-En-Scène?”, in Cahiers du Cinema: the 1950s, ed. Jim Hillier, Routledge and Kegan Paul, London, 1985, p. 267. Originally published as ‘Qu’est-ce que la mise-en-scène?’, in Cahiers du Cinéma 100, October, 1959. “Les jeunes réalisateurs français ont-ils quelque chose à dire? – Alexandre Astruc”, Claude-Marie Trémois, in Radio-Cinéma-Télévision, no. 40, January 18, 1959. Quoted in Alexandre Astruc by Raymond Bellour, Editions Seghers, Paris, 1963, p. 95. Cited in The Mobile Mise-en-Scène: A Critical Analysis of the Theory and Practice of Long-Take Camera Movement in the Narrative Film, by Lutz Bacher, Arno Press, New York, 1978, p. 231. Astruc, in Jacques Rivette and Eric Rohmer, “Entretien avec Alexandre Astruc”, in Cahiers du Cinéma, no. 116, February 1961, p. 11, quoted in Lutz Bacher, 1978, p. 232. Thomas Elsaesser, “Tales of Sound and Fury: Observations on the Family Melodrama”, in Film Genre Reader, ed. B.K. Grant, University of Texas Press, Austin, 1986. In his discussion of the theories of mobile mise en scène, Lutz Bacher makes a distinction between “long-take theories” and “mise-en-scène theories”. The former, which derive largely from André Bazin’s ideas of ontological realism, focus on the long-take as a means to preserve the unity of time and space, whereas the latter emphasise the expressive possibilities of mise en scène. However, regardless of the motivations which determine the découpage – the breakdown of shots in production – 3this distinction blurs when the focus shifts to reception. Even in Roberto Rossellini, on whose practice, with Jean Renoir’s, “Bazin’s theories were primarily founded”, as Bacher writes, the long-take sequences are experienced as a sensory amplification across time (Bacher, as above, p. 197). As Jacques Rivette has written: “Think of any Rossellini film: each scene, each episode will recur in your memory not as a succession of shots and compositions…but as a vast melodic phrase, a continuous arabesque, a single implacable line which leads people ineluctably towards the as yet unknown, embracing in its trajectory a palpitant and definitive universe …” (Jacques Rivette, “Letter on Rossellini”, in Jim Hillier (ed) 1985, p. 194. First published in Cahiers du Cinéma, 46, April 1955). “Theo Angelopoulos in conversation with Gideon Bachmann”, Film Comment, vol. 34, no. 4, July–August, 1998, 48–54, p. 50. Horton writes, for example, that “there is much in each of his Angelopoulos’ ten features made since 1970 that is quite ‘Greek’, and thus only partially grasped by a non-Hellenic audience” (LM 2). David Bordwell, “Modernism, minimalism and melancholy: Angelopoulos and visual style”, in LM. It is no coincidence that Bordwell’s analysis focuses on the principles of visual composition which he argues determine the “perceptual dynamics of the shot” (p. 19). The core of Bordwell’s argument resides here in the dissection of ways in which the planes, perspectives and spatial transformations in the shot work to cue viewer expectations. The experience of the viewer is here reduced to an “act of apprehension” (p. 23), the mechanism by which the attention of the eyes are shifted to a particular point in the shot (more accurately, in the frame). This is precisely the slippage between two divergent concepts of “physical reality” that Hansen points out, in the critical rejection of Kracauer – one which relies on an empiricist understanding of physical reality as an “out-there” object, observed by the intact gaze of the observer; and fails to grasp the centrality of the corporeal, the material to the moment of perception. Fredric Jameson, “Theo Angelopoulos: the past as history, the future as form”, LM, p. 81 (henceforth PH). Samantha Stenzel, “An Interview with Theodoros Angelopoulos”, Athenian, June 1981, pp 34–35, quoted in Horton, CC, p. 46. Perhaps Gideon Bachmann is seeking clarification of this synthesis when he asks Angelopoulos in an interview: “Is filmmaking, then, for you , a form of poetry, in the sense of the ‘cinema di poesia’ of Pasolini, as juxtaposed to the ‘cinema di prosa’ of Antonioni?” Angelopoulos’ answer: “That is too large a question”. Bachmann, 1998. Hansen quotes Kracauer, TOF, pp 255–56. Gerald O’Grady, “Tessellations and Honeycombs”, in LM. In O’Grady’s elegant and evocative essay, the metaphors of the bee-hive and the compound eyes of insects encapsulate this composite and complementary structuring of material elements into the “making and merging of multiple metaphors”. While O’Grady writes of meaning and metaphor, he layers this understanding itself, folds it into the material experience of the film. Where he describes the complex “commingling” of metaphors in the opening scene of The Beekeeper, it is the materiality of the shot that he sees inscribed into the memory of the spectator: “it is the long take of the image, the long white table, almost co-extensive with the white rectangle of the frame, which enters our own memories…” (p. 52). “It does not aim upward, toward intention, but pushes toward the bottom…” WS, p. 447. Bordwell, in LM, p. 23. Bordwell here discusses the earlier films, but characterises Ulysses’ Gaze and the more recent films as merely an updating of these techniques. Hansen, “Benjamin, Cinema and Experience: ‘The Blue Flower in the Land of Technology’”, New German Critique 40, Winter 1987, p. 219 (henceforth BCE). OWS, p. 10. While elsewhere Hansen acknowledges some allegiance in Benjamin’s writings to a Brechtian idea of estrangement, she traces an ambivalence, arguing that Benjamin’s understanding of shock goes beyond “formal discontinuity and distortion” (BCE, p. 185). Leo Charney, “In a Moment: Film and the Philosophy of Modernity”, in Cinema and the Invention of Modern Life, ed. Leo Charney and Vanessa Schwartz, University of California Press, Berkeley, Los Angeles, 1995 (henceforth IM). For an elaboration of this distinction, see Thomas Ots, “The Silenced Body – the Expressive Leib: On the Dialectic of Mind and Life in Chinese Cathartic Healing”, in Embodiment and Experience: The Existential Ground of Culture and Self, ed. Thomas Csordas, MIT Press, Cambridge, 1990. For an extended discussion of the limitations of the physiological model, see “Cinema and Embodied Affect”, p. 2 ff. I argue here that physiology derives its core concept of the physical body from anatomy, and outline a distinction between this concept of Koerper and the concept of Leib, intrinsically a concept of affective embodiment, “the living body, my body with feelings, sensations, perceptions and emotions”. Walter Benjamin, “The Image of Proust”, in Illuminations, ed. Hannah Arendt, Schlocken Books, New York, 1968, p. 213. Involuntary memory or remembrance “is incompatible with conscious remembering (Erinnerung) which tends to historicize, to fixate the image of memory in an already interpreted narrative event”, Hansen, BCE, p. 200. As Hansen traces the intersection between the between the concept of involuntary memory and Benjamin’s idea of the “optical unconscious”: “like the images of involuntary memory … the optical unconscious does not just actualize a lost prior vision: rather it makes us see ‘images that we have never seen before we remember them’“ (NOW 13, citing Benjamin’s “Little History of Photography”). Benjamin, “On Some Motifs in Baudelaire”, in Illuminations, p. 160. In Horton’s account, it is the construction of temporality that engenders a historical reading in the viewer: “Angelopoulos’ combination of long shots with non-chronological time forces the viewer to be actively engaged in the process of ‘reading’ the images that flow before him or her, both for their narrative significance and for their historical significance” (CC, p. 58). He is writing here of The Travelling Players (1974) but would no doubt apply a similar argument to the similarly-structured sequences in Bucharest, in Ulysses’ Gaze. This cinematic quest mirrors in many ways the film historical project that has informed the work of scholars such as Hansen in the detailed historical excavations of the work of Benjamin and Kracauer. Rather than framing Ulysses’ Gaze as modernist, Jameson sees it as a hybrid work, comprising scenes which “recall older moments of a late modernism from which something new is seeking convulsive emergence” (p. 92). He discerns in the film elements which “leap ahead to a new formal situation utterly unforeseen in the earlier period, and anticipatory of realities not yet adequately confronted anywhere in the art beginning to emerge in our New World Order” (89). He points out that the Greek focus of the earlier films, which “stubbornly” cleave to questions of national culture and history, opens out in Ulysses’ Gaze onto a pan-Balkan contemporary stage. As appealing as this supposed affinity may be, I would argue that Jameson’s adoption of the “new world market” as the overarching model for contemporary cultural production assumes too great an isomorphism between global or regional political realities and narrative forms. Quoted from Angelopoulos’ previous film, The Suspended Step of the Stork (1991). Angelopoulos makes clear in an interview with Horton that Odysseus, The Odyssey and other ancient myths are “reference point[s], ‘figurative match[es]” rather than any more direct models for his film (LM 99). Angelopoulos describes another layer in the film as drawing on the poems of Greek poet Seferis: “we Greeks are a dying race” (LM 97). Horton confirms this expanded field of reference. He claims that Angelopoulos’ method “shares such a broad canvas with his ancient predecessors. Like these early historians, he makes use of stories, myths, known events, and figures, and presents them so as to force us to go beyond the events themselves to ask ourselves about their importance and meaning” (CC 60).